I make my husband and children close their eyes as we exit Santa Lucia station. They shuffle behind me, holding each other’s arms, until I let them look. Their jaws drop, and they gaze in wonder at the scene before them, which has changed little over hundreds of years. As reveals go, it doesn’t get better than arriving in Venice by train. One minute you’re inside a Fascist era railway station, the next you feel like you’ve stepped into a Canaletto painting as you stand beside the Grand Canal watching gondolas, water taxis, barges and vaporetti float by. The first time I saw this view, on my very first trip to Venice in the mid 1980s, I cried. My husband has tears in his eyes too; he knows how much I’ve been anticipating this moment. 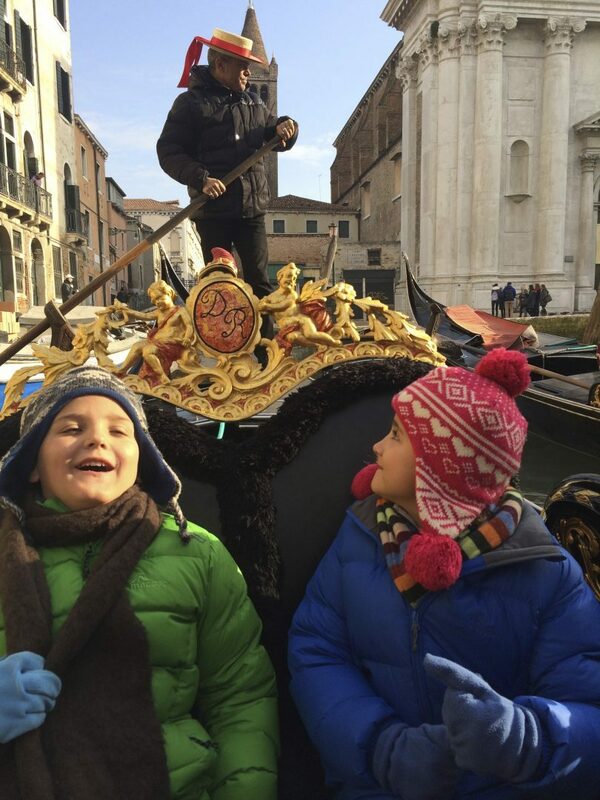 I have loved Venice for many years and have been longing to share it with my family. In a past life I lived and worked about an hour north, in a town called Pordenone, and in the absence of a social life, spent a day each fortnight exploring the city. I’d arrive by train and the view as I stepped out of Santa Lucia station never failed to take my breath away. I’d visit in all seasons: in spring for the Biennale, in the crisp, cool days of autumn when restaurants serve porcini and truffles, in summer when tourists almost choke the city, and in winter, my favourite season, when it’s misty and moody and the sun, low in the sky, casts deep, dramatic shadows. Each visit I’d earmark a monument or museum or building to explore, over a year ticking most of the city’s churches and all of its major sights off my list and returning to my favourites – the Frari, the Scuola Grande di San Rocco, the Peggy Guggenheim collection – again and again. I’ve stayed in the city’s worst hostel and in its best hotel, and in a pensione, somewhere in between, where our waiter, a doppelganger for Luciano Pavarotti, dripped sweat into our breakfast. I’ve swum in water of questionable quality on the Lido. I’ve eaten sarde in saor, squid ink risotto and cicchetti (Venetian bar snacks) more times than I should admit, and for years, in my extended family, I held the record for most expensive meal I’d ever made my father pay for – a memorable dinner at the justifiably famous Harry’s Bar. 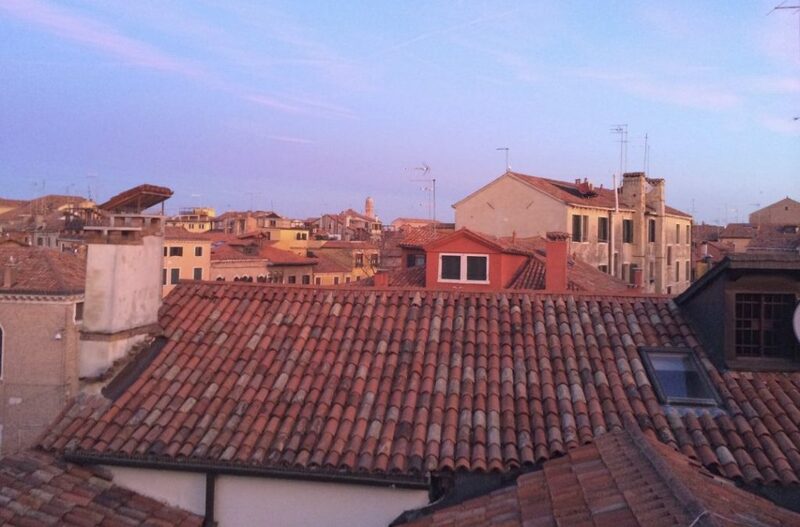 This time around, travelling with my own family, we’ve opted to stay in an apartment in the Dorsoduro area. The plan is to enjoy Venice in its quietest season and live, as much as possible, like locals for a week. Our two-bedroom apartment, in the heart of the Dorsoduro sestiere, is a cosy third floor walk up with views from three sides over church bell towers and terracotta-tiled rooftops. For food lovers, it couldn’t be better positioned. At street level, beneath our two-bedroom pad, there’s a pasticceria selling the pre-Lenten local staple, frittelle, plump little doughnuts oozing with zabaglione, sweetened ricotta or chocolate custard, and just beyond the front door, across a small bridge, is a permanently moored barge which doubles as the local fruttivendola (greengrocer). Around the corner in Campo Santa Margherita are more fruit and veg stalls together with a fishmonger and an excellent little pizza a taglio selling creatively (rather than traditionally) topped slices, with frankfurter and French fries an unexpected hit. Best of all, Tonolo, Venice’s finest pasticceria, is only a short walk from where we’re based and becomes a daily pilgrimage for our morning cappuccino, pastries and thick hot chocolates for the kids. We’re delighted to discover that our chosen neighbourhood, the university quarter, is also home to some of the city’s best casual eateries so we don’t have to venture far, or spend excessively, for a good feed. On our first night we wander into a nice looking trattoria in Campo Santa Margherita, only to discover we know the waiter; he’d worked for years at one of our favourite Sydney Italian diners, Fratelli Paradiso. Staying in an apartment, however, means we are not beholden to eating out if we don’t want to, and when jetlag strikes a knockout blow, a day into the trip, we’re thankful. It also allows us to make the most of the picturesque shopping opportunities. 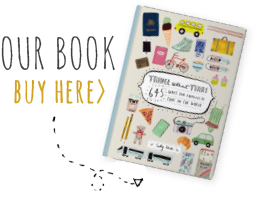 I’ve written travel guides about Italy, and plenty of articles on Venice, but I know, as a parent who travels frequently with her kids, that all children listen better to a guide who can engage their attention than to mum or dad droning on with boring facts from a book. Stories are more interesting than facts for kids. So for our first morning of exploration I’ve arranged a walking tour with Rita Sartori from Alternative Venice who specialises in taking her charges off the beaten track, to give them a taste of what the city must have been like when it was a centre of commerce rather than tourism. We start in our own area, Dorsoduro, moving to the neighbouring sestiere of San Polo. While Italians aren’t known for their speed walking ability – the passeggiata is only ever taken at a slow stroll – Venetians, who walk everywhere, are the exception to the rule. 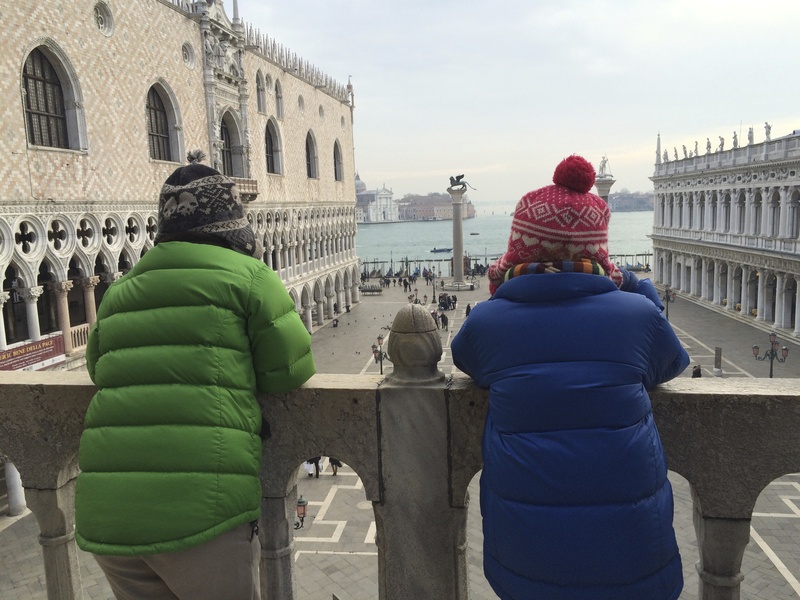 Rita sets off at a cracking pace, stopping to introduce Archie and Lulu to the symbol of the city, a winged lion, and giving us a potted history of Venetian architecture. As seafarers and traders, Venetian residents had to build palaces that would accommodate their businesses too, so the ground floors were devoted to storage and commerce while the first and second floors, the so-called piani nobili, were where the family lived and entertained. With Rita, it’s all about details: a sign over a doorway indicating that shoemakers plied their trade here; how ancient buildings were constructed next to each other; fish-themed decorative capitals on columns in the famous Rialto fish market. She leads us down tiny calle, or laneways, lined with antiques shops, galleries, and artisan boutiques. She explains that Venice is actually a collection of 118 islands joined together by more than 400 bridges, and every time you go over a bridge you’re moving to a different island. And while it’s a city built on and around water, and boats are ubiquitous, the easiest way to get around is on foot. If you go to Venice, pack sensible shoes and expect to walk. Our visit, in early January, means that the preseppi or nativity scenes that most churches set up for Christmas are still in place. In some churches these are quite exquisite and intricate, with music, lights and mechanical figurines that move. The children become mesmerised which allows us time to explore the hidden chapels and artworks that can be found in every one. Many of the churches are cold and dimly lit which just adds to the atmosphere. 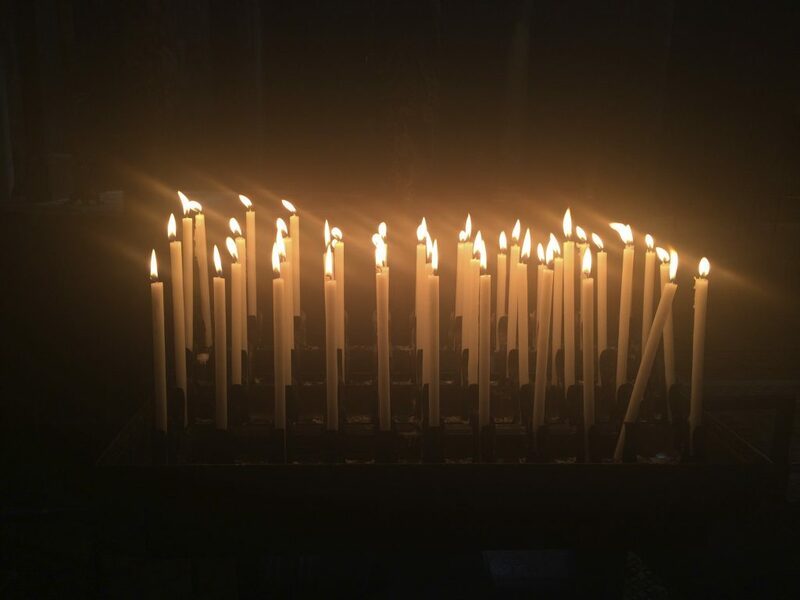 Even to the non religious, the spirituality of these places is remarkable, and quite unprompted, the kids take to lighting candles for special people they love who are no longer in their lives. We’re here just weeks before the start of Carnevale so decorative masks, ranging from tacky tourist tat to exquisite artisan creations, are everywhere. 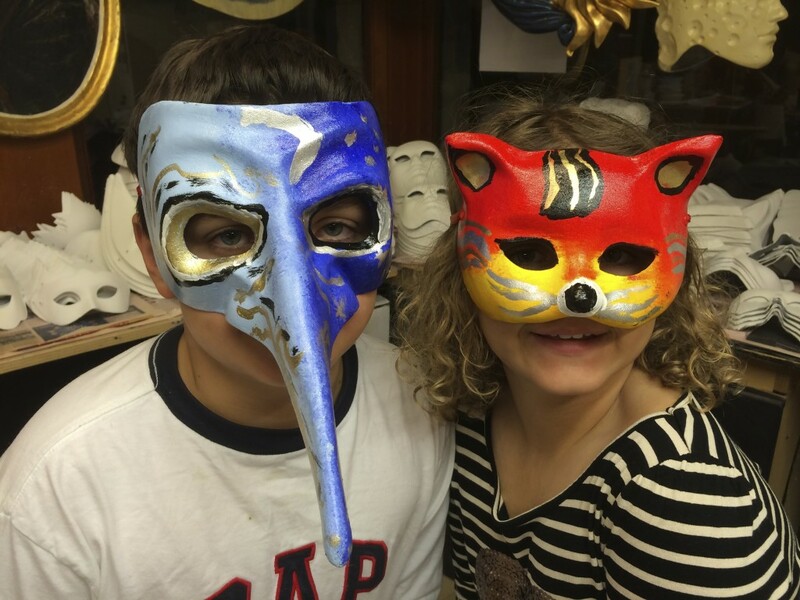 At a traditional workshop the kids get to try their hand at painting their own creations, producing, over several hours, their all time favourite travel souvenirs. I’m slightly disappointed that the kids aren’t as awestruck as I am by the byzantine mosaics covering St Mark’s Basilica, which to me is among the most astonishing artistic achievements for its time anywhere in the world. The last time I was at St Mark’s, 18 months earlier in the peak summer tourist season, I’d had to queue outside and upon entry found myself sandwiched in a pack of tourists and only able to walk in a pre-determined direction at a pre-determined speed. There are still plenty of tourists during our visit but no queues and we’re free to wander where we like. 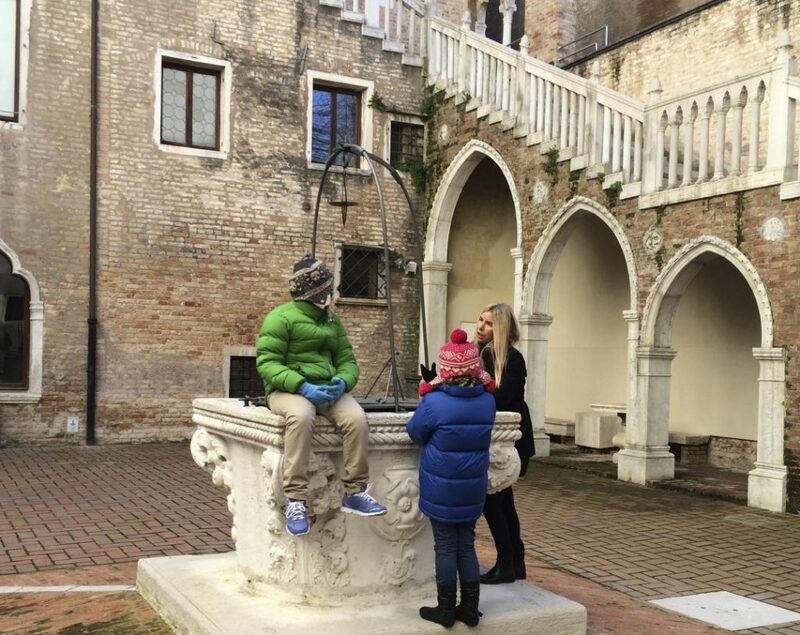 The children particularly love the small museum accessed via a steep set of stone stairs that contains precious artefacts from the basilica and allows you to walk on a terrace overlooking the piazza for unparalleled views. The album of family selfies gets some fabulous new additions. However, they are just as entertained by the man blowing giant bubbles on the seafront nearby, in front of the Doge’s Palace, and chasing pigeons through the square. There’s no denying that Venice is expensive. 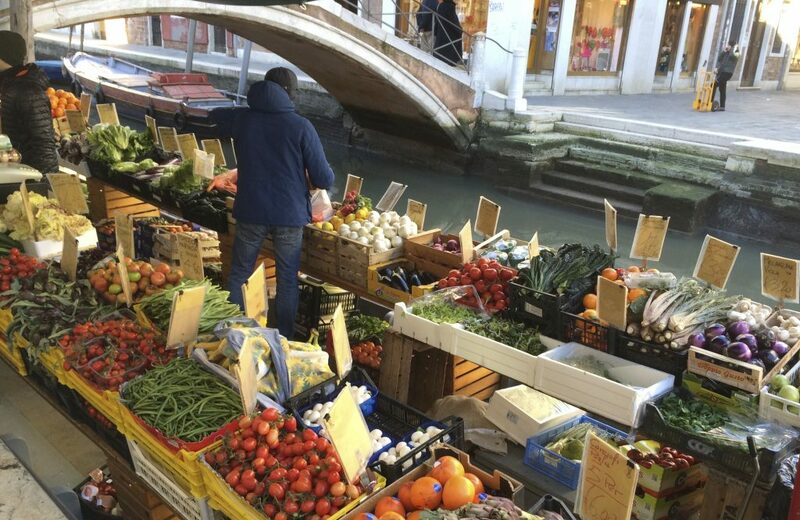 If you don’t walk everywhere getting around can be costly – a three day pass for the network of vaporetti costs 40Euro, a single one-way ticket is 7.50Euro – and gondola rides – the ultimate Venetian tourist cliche – are extortionate. Indeed, in my years of visiting the city I’ve always avoided them, so I immediately dismiss Lulu’s request. My daughter is nothing if not persistent and she eventually wears me down, finding a gondolier near our apartment who’s willing to cut a deal. Clichés aside it’s a lovely thing to do as you quietly float through the water, although not especially comfortable and a bit scary when you end up in the middle of the Grand Canal with vaporetto bearing down on you from all directions. For Lulu at least the bucket list is ticked. One of the wonders of Venice, at any time of year, but especially in winter, is that it’s quiet. Blissfully quiet. There are no cars, no traffic. Along the Grand Canal there are vaporetti and service barges, but away from it there is just the sound of footsteps, chatter and church bells. The latter become a feature of our stay. From our third floor eyrie we can see half a dozen bell towers, which ring in the hour. Even in our jetlagged state as we wake at strange hours of the night, it’s actually a delight to hear the bells toll. Winter brings high tides and the city is prone to flooding. We see boardwalks piled up everywhere ready to be deployed but are lucky to avoid an inundation. Lulu however has her own personal aqua alta moment when she converts the shower recess into a bath by sitting over the drain, in the process overflowing the shower and flooding the stairwell below. Turns out, it’s a good way to meet the neighbours. Our days settle into an easy rhythm. We wander, we look, we eat. On a day trip to Murano we find many of the glassworks closed for the off season but the beauty of these outerlying lagoon islands, with their pastel painted houses and pretty churches, is that they are just a little bit different to Venice itself. 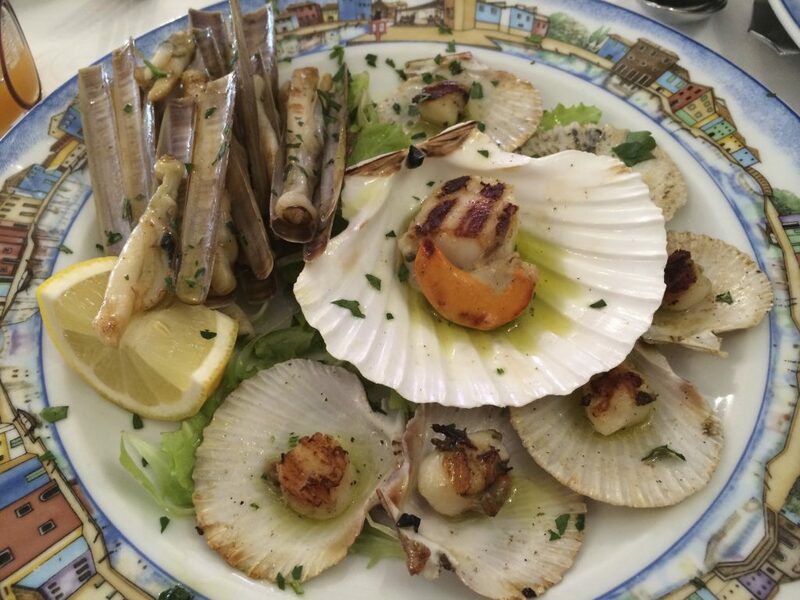 We follow up a restaurant recommendation and at Il Gatto Nero on Burano, the neighbouring island, where lace was traditionally made, and enjoy one of the best seafood meals of our lives. In fact we enjoy it so much that we miss the last direct vaporetto back and our route home becomes a convoluted journey on three separate ferries, with a bonus spectacular sunset thrown in. 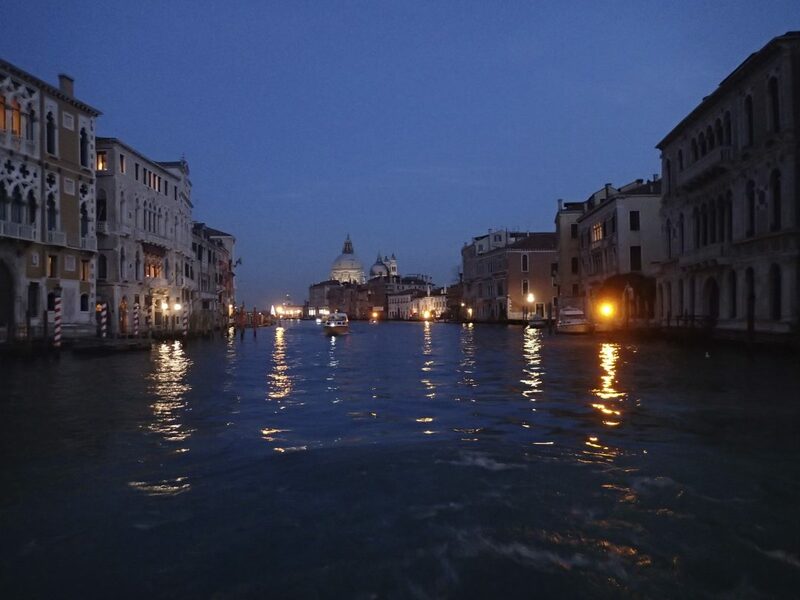 It’s dark when we finally reach the Grand Canal but the water is dancing with reflected light from the palazzi on either side. Yet another perfect, magical Venetian vista in a place that does them so well. More information: www.venice-tourism.com; www.italia.it Getting there: Singapore Airlines (www.singaporeair.com) flies to Rome via Singapore from all Australian capital cities. There are regular connecting flights to Venice’s Marco Polo airport. Alternatively there are regular high-speed trains that travel at up to 360 km/h from Rome Termini station to Venezia Santa Lucia. Book tickets through www.raileurope.com.au. Staying there: Palazzo Foscarini Apartments has a selection of two-bedroom apartments in the Dorsoduro neighbourhood. http://www.palazzofoscarini.com. Alternative Venice (www.alternativevenice.org) has customised two-hour walking tours from Euro150. This article was first published in traveller.com.au.